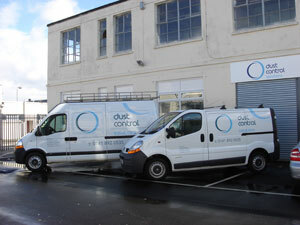 Dust Control Solutions Ltd are a highly experienced ventilation companies in Scotland. We serve all the major towns throughout the country and also the rest of the UK. With great expertise we can complete a variety of ventilation jobs to a very high standard. Our company designs, manufactures and installs ventilation systems for many industries. Ventilation issues can be dealt with the use of the following systems. Ventilation systems that provide cooling air - systems intended to supply spot cooling for personnel in intense temperatures or environmental hazardous areas. General ventilation systems, including fume cupboards that handle hazardous fumes. Ventilation systems providing negative or positive systems, gas turbine ventilation with all apparatus and fans suitable for function if required up to Zone 1, high pressure cooling fans operating up to a pressure drop of 2,000 pa.
Our service engineers are available 7 days per week 52 weeks in the year in Scotland and other parts of the UK. When needed, we can supply temporary extraction should a serious breakdown occur.